successful retail signage and POS displays. 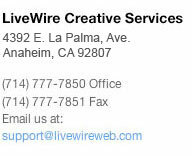 LiveWire can make them come alive for you. From rooftop to counter top to retail floor, we have a solution that will keep the customers coming back for more.